The students of two schools – Secondary School of I Grade “G. Carducci” and Linguistic High School “Vallisneri” – become for one day official guides of the Puccini Museum – Casa natale. The Giacomo Puccini Foundation promotes a didactic project from the title ”Puccini at school” in the schools of the territory. 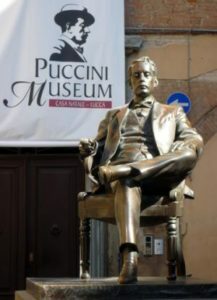 This project has the purpose of approaching the students to the great composer: to learn about the life and the work of Giacomo Puccini and the narrow bond that he had with his city, to stimulate the interest and the curiosity of the students towards their illustrious fellow citizen and in general of the melodrama. In fact, the Opera is not among the most popular music genres, and it’s also one of the less-known repertories in our school’s training practices, and therefore the project aims to encourage the didactic action of the teachers, sensitizing them to the importance of an education of the pupils to the musical theatre and providing them suitable tools to be able to operate in view of this goal. Guides for one day will be some students of Class III LA of Linguistic High School “Vallisneri”. To take part in the visits, you must book online or call 0583/584028. The guided tour is included in the normal cost of the ticket. The Giacomo Puccini Foundation thanks the schoolmaster Professor Gabriella Nanini and the professors Giuseppina Giocondo and Lilli Moira of the Secondary School of I Grade “G. Carducci” and the Liceo “Vallisneri” schoolmaster, Professor Monica Ceccherelli, as well as the professors Sonia Dini, Manuela Pucci and Michela Simonetti for having received with enthusiasm and actively supported this initiative. Thanks also to the Leonardo da Vinci Secondary School which has joined the project Guide for one day, where the students will accompany their family members inside the Puccini Museum – Casa natale.